When you think of what a cosmetic dentist does, you might think of beauty pageant queens and starlets with perfect, winning smiles. But a cosmetic dental practice does so much more than fit veneers and close gaps in teeth. There are many services that your Naperville cosmetic dentist can offer to help you feel more confident about your smile! 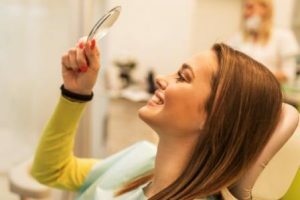 Why Might Someone Need Cosmetic Dentistry? Your teeth came in crooked. Cosmetic dentistry can use a variety of methods to align teeth. Our methods include Invisalign, a clear, custom fit retainer that discreetly straightens teeth. You have a decayed tooth. Our Naperville cosmetic dentist can make repairs using tooth colored fillings. Or, your tooth can even get a replacement with an implant that looks like your natural teeth! You have damaged teeth from an accident. Plenty of people seek out a cosmetic dentist for full mouth restoration after having trauma to the face or jaw. You have a habit of grinding or clenching your teeth. We can fit you with an appliance to rescue your teeth from further damage. You have misaligned or discolored teeth. Our Naperville dentist can help with lumineers. Lumineers are contact-lens-thin veneers that restore your smile to beauty and fill you with confidence. You have gums that cover too much or too little of your teeth. A cosmetic dentist can reshape your gum-line, making your smile look even and attractive. Do You Really Need Cosmetic Dentistry? A great smile gives you confidence. This can make a big impact on your life at home, at school and in the workplace. Your relationships with family, co-workers and bosses can improve, because you never have to worry about what your teeth look like. A great smile gets used more often. When you smile, people instinctively trust you more and like you more. A smiling person makes the people around them smile and feel more relaxed. When you have a great smile, you are more likely to use it and this can open many doors for you. If you have actual decay or damage, cosmetic dentistry not only fixes the problem but takes your smile up a level. You get rid of unseen pain along with any visible issues, and your whole body health can benefit from a healthy mouth. Still not sure if you are ready for cosmetic dentistry? Our Naperville dental practice is the perfect place to find out. You can schedule an appointment to find out what options are available to you. Discover the wide range of cosmetic dental services that are ready and waiting for you to enhance your smile! Patients over 50 can take advantage of our 50 & Better program. It includes a free Adult exam complete with x-rays and a personal consultation with the Dr. Lydia Sosenko or Dr. Bryan Weyneth. Don’t let a less than perfect smile hold you back. Everyone deserves a smile they can be confident in! Schedule your appointment with us today.